The president of the embattled agency, Reese Jarrett, abruptly announced his retirement Wednesday. The news came after a lawsuit gathered momentum and enough accusations to force the mayor to the table. Now, settlement negotiations, along with leadership changes, could mean the end of the agency, or major reform, is imminent. San Diego’s unique downtown development agency, Civic San Diego, is in chaos. City leaders are considering making significant changes to it, if only to put an end to ongoing turmoil. The mayor’s representatives are negotiating with the agency’s most prominent opponent and they could strike a deal to remake an organization that’s been besieged since it was created five years ago. And now its leader is on the way out. A lawsuit filed by Murtaza Baxamusa, a former Civic San Diego board member affiliated with the county’s largest construction workers union, is driving the agency’s problems — and may have helped encourage its leader’s retirement. Over the course of his lawsuit, Baxamusa has unearthed a batch of concerns from four current and former Civic San Diego employees. That has given him newfound leverage in a long-running push to weaken, kill or at least reform the nonprofit agency. Mayor Kevin Faulconer faced the prospect of making major personnel and structural changes to fend off the lawsuit and preserve Civic and its general goal of expediting downtown development. On Wednesday, Civic president Reese Jarrett abruptly announced to Civic board members that he planned to retire. The board couldn’t immediately offer details on when Jarrett will leave or under what terms. Jarrett did not respond to requests for comment. But the board chairman’s reluctance to say whether Jarrett would be replaced speaks to the uncertainty facing the agency. “We’ll have to have a discussion about what to do about that position,” said Phil Rath, a lobbyist who took over as board chair only weeks ago. Rath also emphasized that the board was surprised by Jarrett’s announcement. Jarrett had been scheduled to receive a performance review behind closed doors at the end of Wednesday’s board meeting. He announced his plans to retire before that review began, Rath said. Jarrett’s announcement marks a transition for an agency that faced criticism even as it was being formed. And more changes could be on the way: Civic is expecting the results of an investigation into the allegations from past and future staffers any day. Civic San Diego was born from the shell of two scandal-plagued redevelopment agencies and has never escaped their shadow. It exists to finish redevelopment projects that were green lit before the state ended its tax-funded redevelopment program, but also to regulate private development downtown. Its mandate has been to do that more quickly than city staffers. It’s a nonprofit group led by appointed board members and officials with development experience, with light oversight from the city. The idea is that its developer-friendly structure encourages downtown growth. Yet that focus on speed exposed the agency to criticism from labor leaders and other advocates — and now some officials tasked with ensuring that the agency plays by the rules are crying foul, too. Four current and former employees have raised concerns about the agency’s internal controls, ranging from questionable appearances to poor management and potential policy violations. The allegations, though, stop well short of describing the kind of criminal behavior that tarred Civic’s predecessors. The complaints emerged in depositions related to Baxamusa’s lawsuit, and a 28-page memo from one staffer. Together, they’ve created a sense of chaos surrounding the agency. None of the accusations have been proven, and Civic denies all of them. Yet the sense of chaos nonetheless pushed city leaders to consider making major leadership changes at the organization, or altering its ongoing structure. Baxamusa’s lawsuit doesn’t seek any money, just reform at the agency. Over the past two years, the agency has spent more than $30,000 on outside investigators to dig into the allegations, including the one expected to be released to Civic officials as early as this week. Meanwhile, Faulconer has remained silent. A spokeswoman said he’s awaiting the results of the investigation. But it’s no secret that the agency is facing the prospect of major changes. In October, a staffer at the San Diego chapter of the Building Industry Association, in an email obtained by Voice of San Diego, asked the city’s development community to show support for the agency. Negotiations about the future of the agency are now well underway. 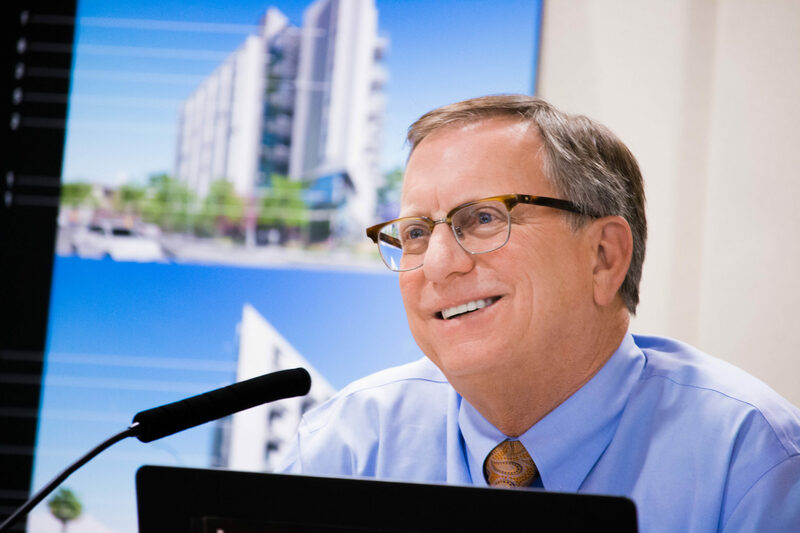 Baxamusa and city officials agreed in December to a 90-day stay on the lawsuit to pursue settlement talks, which Steve Coopersmith, Baxamusa’s attorney, confirmed are strictly over the future of Civic San Diego. The four current and former employees raised a slew of concerns about Civic and Jarrett. No single accusation is damning but there are many of them. Most raise questions rather than offer conclusions. In the last two years, Civic community relations specialist Cynthia Suero-Gabler, ex-economic and community development director Derek Hull and the agency’s current asset and contract manager John Anderson have raised concerns about alleged conflicts of interest and failures to follow contracting policies, including attempts to award contracts without a proper competitive bidding process. Suero-Gabler, once Jarrett’s executive assistant, also claimed he forced her to use personal time off to help he and his wife move and to work at a charity golf tournament. She alleged retaliation for the concerns in a lawsuit filed last July. 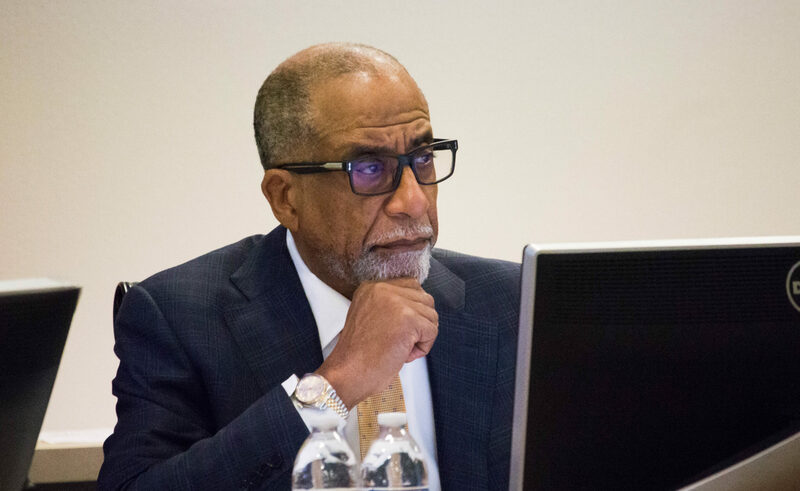 Former Civic Chief Financial Officer Robert Avery, who was fired last February after a closed session board meeting, also filed suit against the agency. He claims Jarrett and others left him out of meetings and reassigned some departments that Avery oversaw when he began raising questions. Attorneys for Civic, Suero-Gabler and Anderson are finalizing yet-to-be-detailed settlements for both. Lisa Greeson, Civic’s assistant vice president who oversees human resources, said the agency sought an investigation of Anderson’s allegations in November. That’s when the agency learned of a 28-page memo he’d written that alleged internal controls had “eroded significantly” since Jarrett took over as the agency’s president in 2014. Civic hired Bell Canyon-based workplace investigation firm EXTTI, Inc., to scrutinize his claims. Greeson said the investigation is expected to be delivered any day. It has already cost the agency more than $21,000. In 2016, Civic hired San Diego-based DMB Legal Consulting to investigate Suero-Gabler and Hull’s complaints. The agency said former Civic San Diego board chair Jeff Gattas and the agency’s attorney later informed Jarrett of the results of the $10,800 investigation. “Since these are confidential personnel matters, Civic is unable to comment further,” the nonprofit wrote in a statement. Jarrett declined to comment on these and other allegations. Jarrett ultimately received a 6.5 percent pay increase a few months after the investigation. Nearly two years after Baxamusa filed his lawsuit, Anderson’s accusations gave him something of a breakthrough. 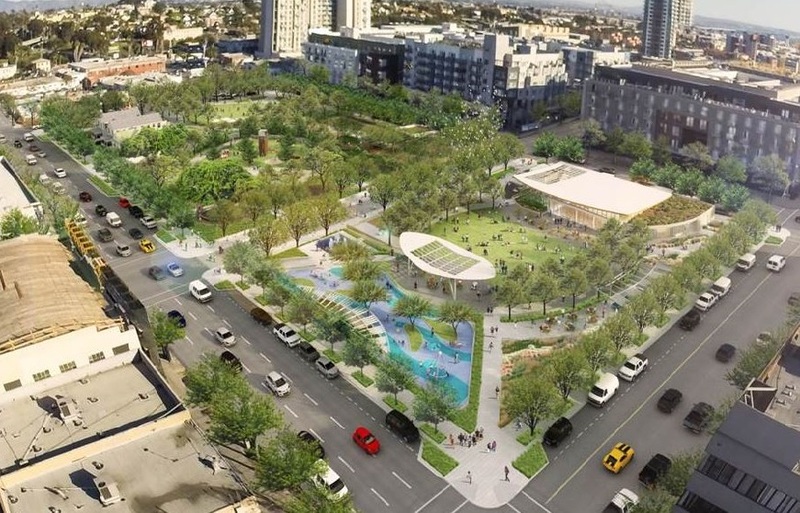 Anderson, who was responsible for overseeing Civic’s contracting process, raised questions about a contract that Civic had with the Office of James Burnett, a landscape architecture firm hired to prepare plans for a four-acre East Village Green park. A 2014 request for bids sought a contractor to create a development plan and noted that contractor would likely be hired to produce construction documents, too. The board approved a $316,000 contract several months later. Last year, without going through another bidding process, Civic inked a much larger $4.76 million contract with the firm to prepare construction documents and manage 19 other project consultants. Anderson said in a November deposition he believed the arrangement violated a state law barring public officials from making contracts they have a financial interest in. The state’s Fair Political Practices Commission has previously advised the city that consultants who serve in key advisory roles on projects can be subject to the conflict-of-interest law. “For these types of projects, you can’t create work in the first phase of a project so you get more work for yourself at the second phase,” Anderson said in his deposition. In an interview with VOSD, Civic Assistant Vice President Brad Richter defended the agency’s approach. He said Civic worked with its legal counsel to word the initial request for proposals to allow Civic to swiftly back out if the Office of James Burnett’s work wasn’t up to snuff. Richter recalled Anderson had repeatedly approached him before the $4.76 million contract was approved and seemed to misunderstand it. Los Angeles-area attorney William P. Curley III, a longtime contract attorney for local governments and a onetime city planner, and Gil Cabrera, former chairman of the San Diego Ethics Commission, said the contract isn’t a clear violation of Section 1090, a state statute that bars public contractors from setting themselves up for new contracts. Proving a violation would require showing that the firm took clear steps to ensure they were awarded additional work such as framing designs so only they qualified for the work or to entice Civic officials to retain them. It’s not clear that happened — and Anderson didn’t offer any proof in his memo or depositions. “If merely doing a good job is what they did, then there is no 1090 (violation),” Curley said. In his memo and depositions, Anderson accused Richter and others of repeatedly flouting the rules to deliver the speed and added certainty that the organization’s boosters argue makes it valuable. Indeed, he attached to his memo a spreadsheet full of contracts that concerned him. Anderson claimed Richter and other officials avoid bidding processes and favor particular contractors. Rath and Civic officials are now bracing for the results of the investigation that should clarify the state of an agency that’s been under fire from the start. Rath said he plans to take a closer look at the agency’s bidding process and Civic’s past contracts to ensure the agency is following best practices regardless of the results. “I think we need to make sure that we have a procedure in place to have board-level oversight of all the different contracts we have running through Civic and make sure we’re actually getting the product or service that we’re purchasing, that the contractors are being responsible and reporting what they’re supposed to and that we’re competing those on a regular schedule so we can always make sure we’re getting the absolute best value,” Rath said.